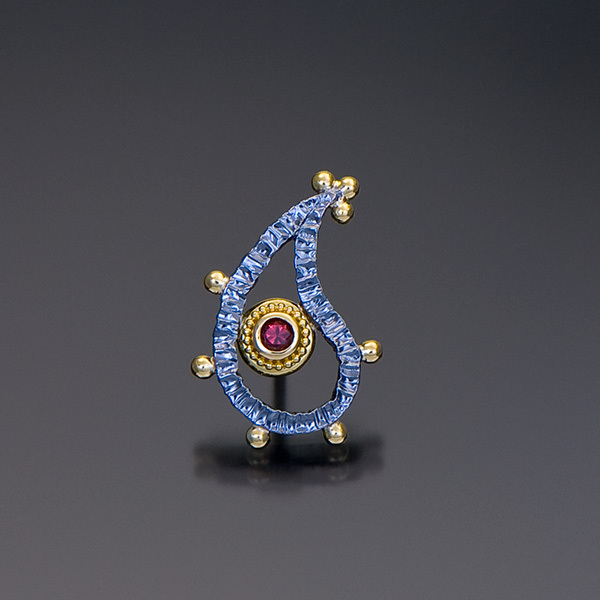 Tie Tack is set with a Red Spinel (.13cts) in granulated 22kt yellow gold with a forged and oxidized sterling silver frame and an 18kt white gold finding. 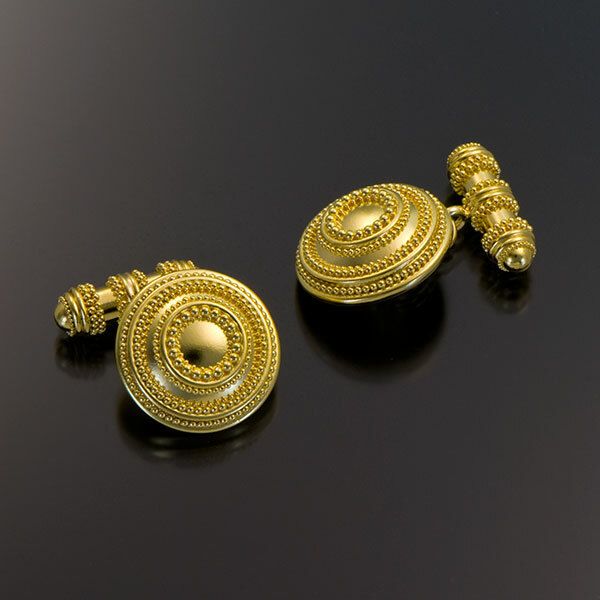 These cufflinks consist of a domed side and a tube side in granulated 22kt yellow gold with a traditional chain link connection in 18kt yellow gold. 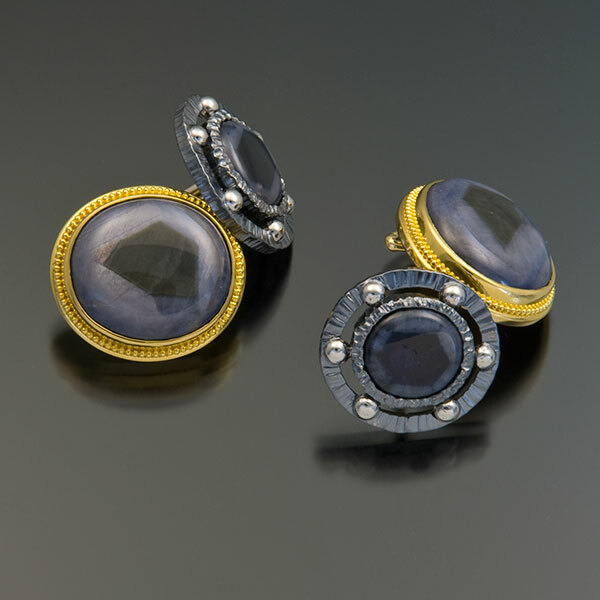 Double-sided cufflinks are set with Trapiche Sapphire cabochons (1 pair @ 17x19mm & 1 pair @ 10.5×11.5mm). One side of the cufflinks is in granulated 22kt yellow gold and the other side is in forged and oxidized sterling silver accented with platinum granules. The connections are in 18kt yellow and white gold with a safety hook. 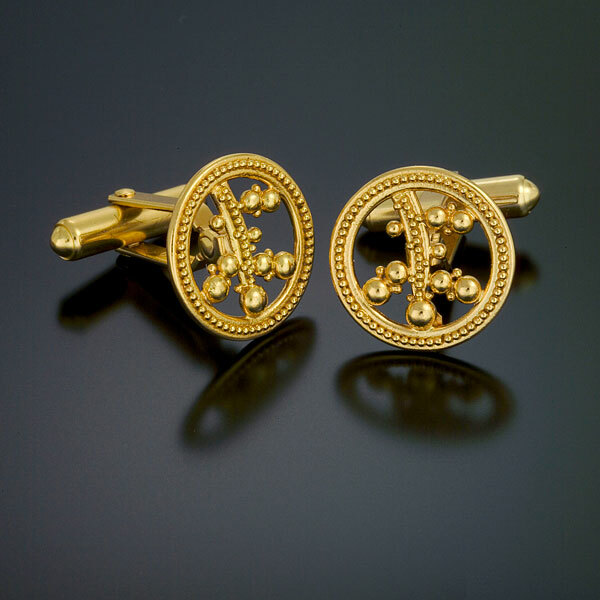 Cufflinks in 22kt yellow gold with 18kt yellow gold swivel links. 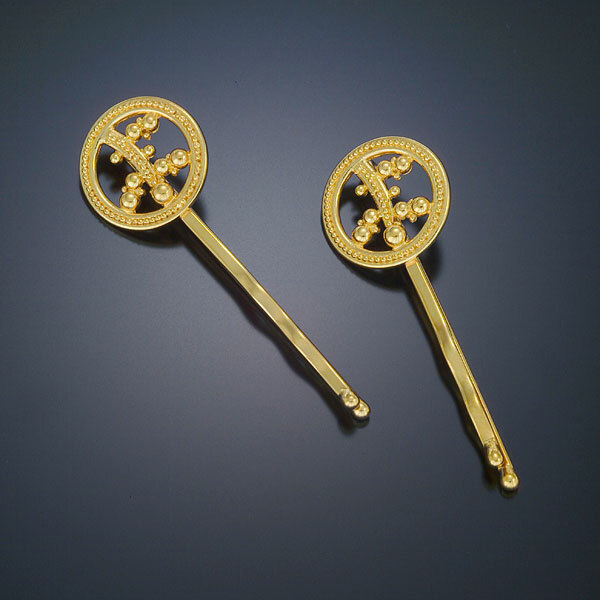 Bobby Pins in granulated 22kt yellow gold with 18kt yellow gold pins. 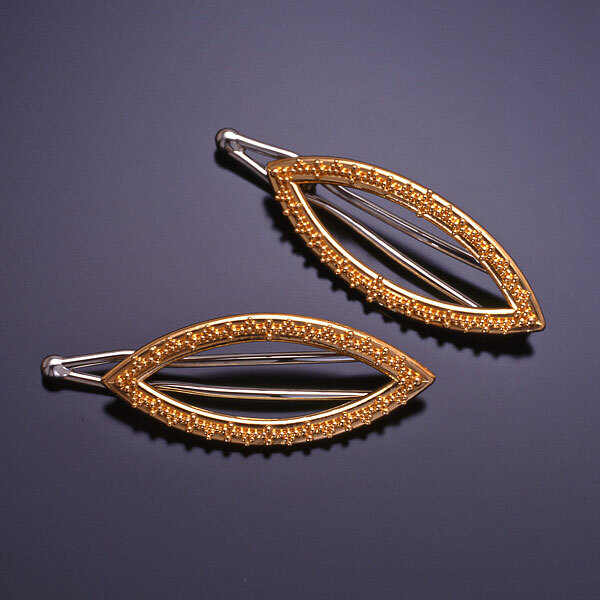 Barrettes in granulated 22kt yellow gold with 18kt white gold clasps. 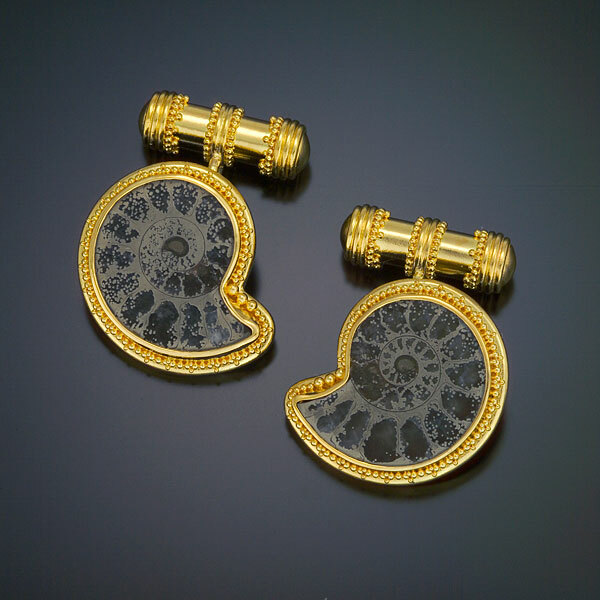 Cufflinks are set with fossilized Ammonites in granulated 22kt yellow gold with 18kt yellow gold traditional style linkage. 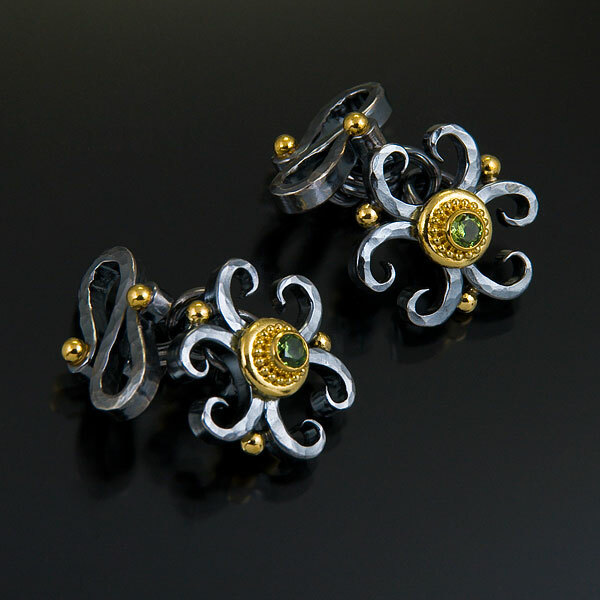 Cufflinks are set with Demantoid Garnets (.34tcw) in granulated 22kt yellow gold with hand forged and oxidzed sterling silver, traditional link connections, .75″L x .75″W x 1″D.